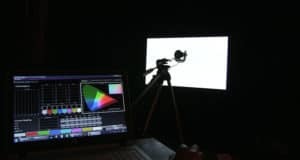 A few months ago we tested Philips 65PUS7601 and concluded that it is a TV with a great price to performance ratio, a true best buy if you are after a full-array local dimming LED LCD TV with UHD and HDR capabilities. 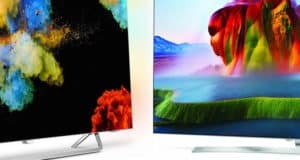 TV’s Perfect Pixel Ultra HD engine is very impressive in terms of sharpness, color and HDR performance, but starting with 2017 TV lineup there is an upgraded version of the engine available. That is the reason why we accepted immediately a chance to review latest Philips TV, 55-inch 55PUS7502 that has new P5 Perfect Picture Engine for which the company claims overall 50% picture quality performance gain. 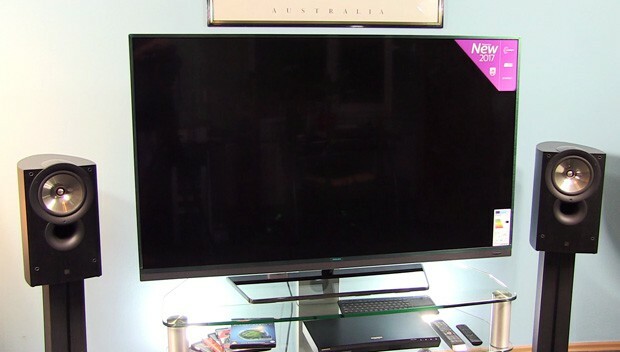 Just like previously tested Samsung 40MU6400, we took the new Philips TV through our tests – check out how did it go. Summary : Philips 55PUS7502 is a good but not a great TV that receives only partial recommendation from us. On the positive side, it has a modern look with rotatable stand which is a rarity these days. All connection options you might need are present - including Wi-Fi and Bluetooth. Remote has integrated QWERTY keyboard and TV runs on Android 6.0 system which was more stable and faster than any Android TV we have seen before. The new P5 processor does not offer a huge improvement in picture quality, but small optimizations are definitely here. Color accuracy is very good by default and can be further improved with calibration. Motion resolution is also a plus and same goes for the viewing angles. The areas where situation is not so great is in low contrast which is to be thanked to IPS panel. Even though Ambilight helps in creating perception of better blacks, this is still not as good result as on TVs with VA panels. Despite the new picture processor, interlaced signals are still not properly displayed and this will affect those watching live content over digital tuners. HDR performance is only mediocre due to low contrast and lack of local dimming. For not demanding users who want sharp image and like combination of Ambilight and Android in one package, this TV can be recommended. For those who prefer high quality home theater experience, there are better choices out there. Philips 55PUS7502 is a 55-inch flat-screen TV with thin silver bezel, built-in soundbar and central metal stand. The brushed aluminum bezel is 10 mm wide and there are additional 4 mm till the active part of the screen. The soundbar is placed along the lower bezel and is 25 mm tall. Its front surface resembles that of speaker grilles, even though Philips has implemented a perforated plastic cover in this case. There is only a minimum amount of distracting elements on the front side – Philips logo in the center area and status LED light on the right-hand side of the soundbar. The screen is semi-glossy and it can only partially blur out the light on its surface. Philips Moth Eye and Samsung Ultra Black filters are much better at this, but on the other hand, even a very expensive TVs such as 2016 Panasonic DX900E or Sony XD9305 perform very similarly to the tested TV. Conclusion – for the best result you will have to increase the luminance of the screen or adjust its position so that reflections are reduced. A look from the side reveals slim backside that is thinner (15 mm) in the upper area and a bit thicker in the bottom (40 mm). What we like is the fact that the upper part is made of metal which increases the strength of the construction which is always a plus. The backside also houses 3-sided Ambilight with a total of 41 LEDs (10 on each side and 21 on the top). 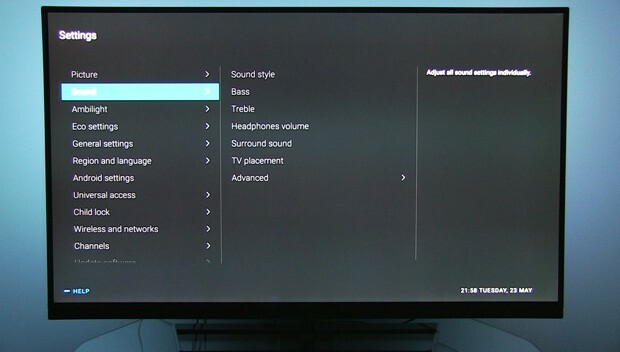 It is nice to see that along the most frequently used interfaces, such as HDMI and USB, Philips is not following the trend set by Samsung to completely remove headphone jack and analog inputs from its newest TVs. The metal silver stand has one feature that is rarely seen on TVs lately – it allows for the rotation left – right. 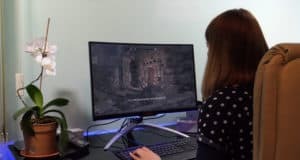 Even though this is not so important since IPS panel is used, on the other hand, it allows the user to easily adjust the angle either to reduce light reflections or to fit his current seating position. The only downside is that the stand does not hold TV as firmly as most fixed stands, as the screen wobbles a lot when pushed. Overall, build quality is good and TV looks nice. 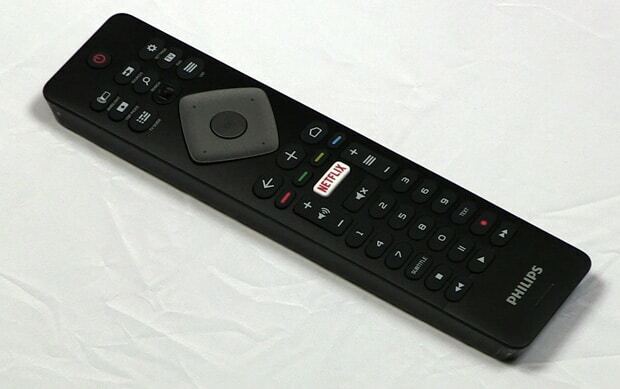 Over the years many TV manufacturers have become known for the special features their remote control offer. Many favor LG for their Magic remote control since it tracks your hand’s gestures to move the pointer across the screen. A few years ago Samsung went with compact and simple remote controls with just a few buttons. Philips tried both paths, but at the end settled with full QWERTY keyboard on the backside, along with standard layout on the front. 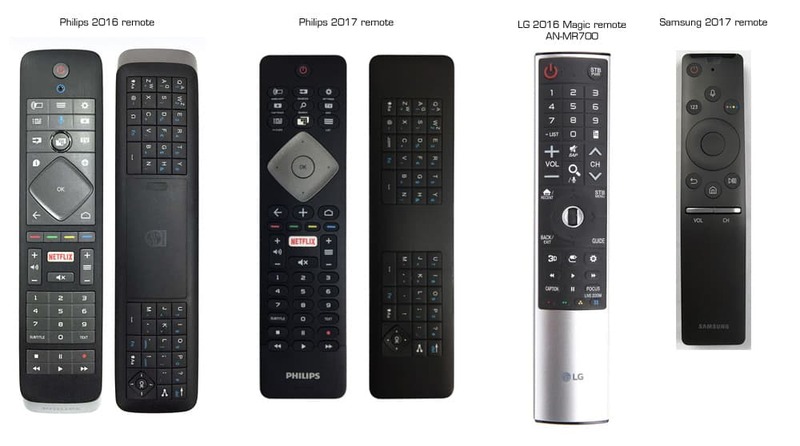 Compared to the 2016 version, the new remote is less crowded around the navigation and buttons are now separated. Touch surface that causes more frustrations than benefits is no longer present, at least not on the remote that comes with 55PUS7502. A built-in microphone is also removed from the new version – doubt that anyone will miss it. The battery compartment is now on the bottom of the front side and it houses 2 AAA batteries (supplied). There remote feels good in the hand and we like the new layout with bigger buttons. What we do not like is that many buttons have the same shape so it is hard to pin-point for example Subtitle or Text button in the dark. 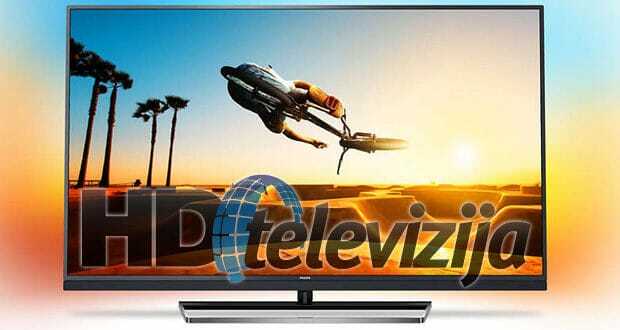 Philips 55PUS7502 is based on Android TV platform. We tested our sample with version 6.0.1. 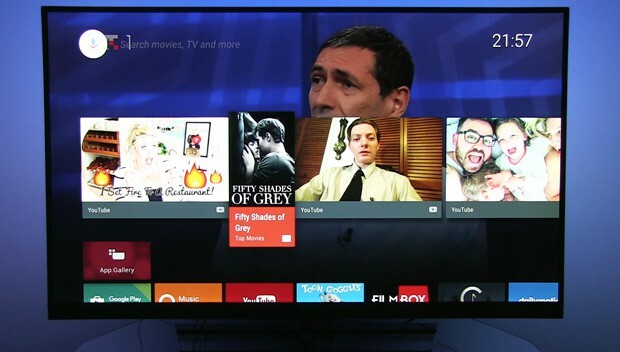 Philips was the first company that introduced Android TVs in 2014 and has improved it ever since. The latest installment did not change the looks of the menus, but even after a few weeks of usage, it is evident that 55PUS7502 runs the platform faster than TVs before and more stable as well. During the test we did not see any message about an app stopping or crashing and going through the menus was smoother than on Philips 65PUS7601 we had in the same room. Great result and good job, Philips! The interface is still upscaled Full HD, so text and graphics are not “Ultra HD” sharp – nothing alarming since other TV brands also still use lower resolution menus. You can access Google Play Store, Games, Movies & TV and Music and download different apps, free and not free. Different USB peripherals are supported such as gamepads, keyboards and mice – we tried Logitech gear and it worked flawlessly. There are also many video-in-demand apps such as YouTube, Vimeo, Netflix, TED TV, etc. The easiest to use is Netflix since it has a dedicated button on the remote control that will even turn on the TV from stand-by and start the app. Users with private video, audio and photo collections will appreciate Kodi and Plex apps, along with many different video players available in the Google Play Store. However, as last year, we noticed that there is no perfect app for video playback, especially if you want to play HEVC content, over USB but especially over the network. We noticed a lot of stuttering during playback of our demo materials, while this was not the case with h.264 content. Built-in media players in LG and Samsung TVs do a better job in this regard. 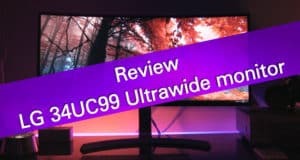 I am very interested in this TV because it has the two main things that I looking for, Android and Ambilight but I recognize after seeing the review I’m really worried about the low contrast it has. So I have a question, the contrast is as bad as it looks or truly may be acceptable? I looked it today. At showroom it has better colour n black than sony’s 8505. I like it, will buy soon. Va panel have bad angel.. We r 5 at home. Ips is better than va. Thank you for great review. I’m little confuced about Philips modelling. 7502 is top of the line with p5 processor but 7272 has local dimming etc. Any change to have this two compared and also screen calibration settings for 7272? 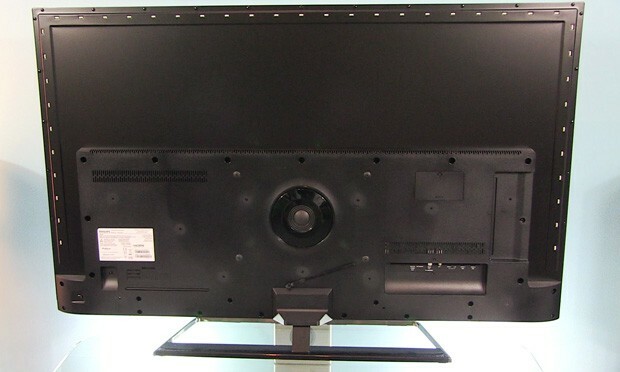 As far as I see specs on this website (https://www.displayspecifications.com/en/model/755fb06), PUS7272 is also IPS TV but with old picture processor, so it does not matter so much that it has local dimming. You can use same tips for adjustment is in the video I made of 7502 as the same type of controls is used. The PUS7502 models recieved the Android 7 update. With this update many bugs are fixed. My model was calibrated using your calibration settings. But after the update it seems like the colors are not the same as before. After the update and a clean installation, because my tv automatically went to standby every 10 minutes, i used your calibration settings again to setup my tv. But like i said, the displayed colors are different after the update. If you ask me i find the colors a bit to red. Can you give me an advise? Nedavno upiknuo 49″ model. Nikako da natjeram tipkovnicu remotea da proradi. Jel ima neki trik ili je Android 7.0 odlučio ne supportati, a Philipsa baš boli briga? How did you found this “black level control was properly working” …where do you you have black control or backlight adjustement” ? I can’t find such options. Hi. I just bought 49pus7503 model, this has VA-panel so the settings in your video are not compatible? Or is it? One small detail that often gets overlooked. There is no way to connect the TV directly to something with a microphone. I tried Bluetooth headsets. the headset jack does not have a microphone, custom remove with included microphone, nothing. That is annoying because google voice always comes up first when searching for something. That, combined with the fact that the remote always ignores your first input, makes it cumbersome to use.